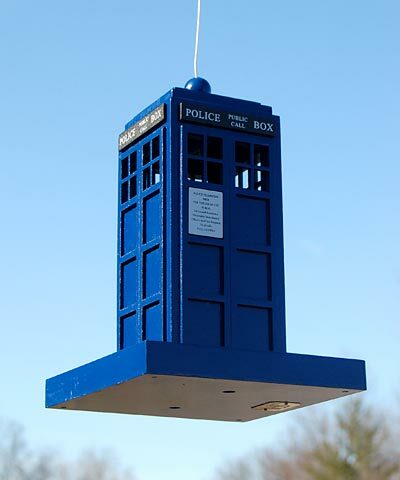 Display your love of British culture in your bird garden with this Home Bazaar Police Call Box Bird Feeder. The rectangular shape and dark blue color of this feeder perfectly match the iconic police call boxes common in Britain, adding a brilliant hint to your backyard. The call box forms a seed reservoir, handily holding 0.5 quarts of mixed seed, and a generous base platform provides plenty of dining area for your feathered friends. Seed easily exits the feeder tube through two gaps at its base, and open windows near the top tell you when it is time to travel into your yard and refill the piece. The cap lifts to clean or refill the reservoir, and a hardy cable here makes it simple to hang the item. Its wooden construction and deep blue color offer a new dimension to your bird feeding, as well as a bold look to your yard. Whether it's your first foray into birding or your thirteenth year, this Police Call Box Bird Feeder will surely bring a recognizable and unique look to your yard. Note: Climate and the elements will weather this feeder and change its appearance over time; however, weathering will add to the item's natural charm without compromising its function. Should you want to preserve the finish (paint) of this feeder, you should cover it with several layers of a polyurethane product that is recommended for marine use (UV Rated). You should expect that once left outside, the item will weather and require refinishing.